I’ve always known about author Jim C. Hines but I’ve never read any of his books. Then I came across iO9’s review of his new book Libriomancer. The headline said it all “Hot damn, this book is pure geeky fun”and I was intrigued. No, dang it, I was smitten. I had to find this book. It sounded so freakishly amazing. Magic straight from books! Yes, I’m on it. Since e-book samples burst onto the scene, I’ve been an avid sampler. More times than not, sampling is what caused me to purchase many books that I wouldn’t have found in my local book store. At any given moment, I have a dozen books I’m currently reading. Yes, both e-books and tangible books. I know, geeky aren’t I? 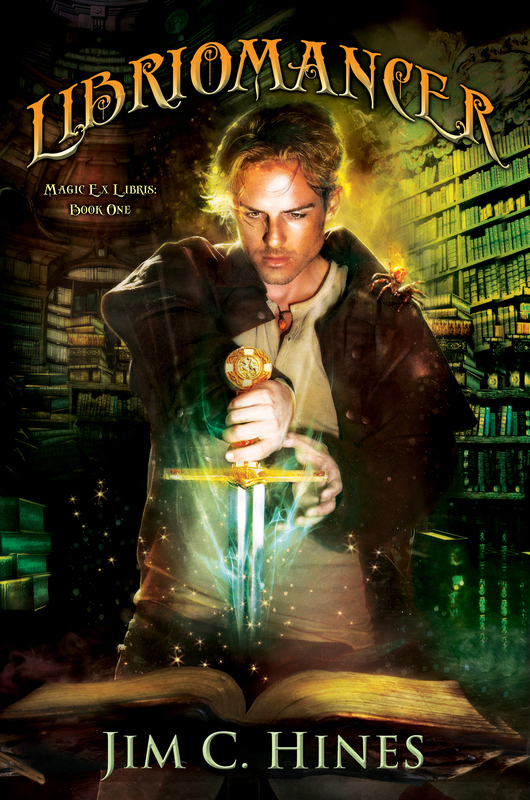 Libriomancer is a funny, surprising, yet serious tale about Isaac Vainio, a young libriomancer with the magical ability to reach into books and remove things from the pages. With his fire spider Smudge, and Lena Greenwood, a double bokken wheeling dryad, Isaac is charged with not only finding their leader Johannes Gutenberg, but also helping Lena find her lover Dr. Shah before their time runs out. Things get even more complicated as he has to find a way to placate the vampire leaders long enough for him and his duo to find and stop the one responsible for a series of murder and mayhem that threatens to turn their magical world upside down. I loved the way Hines incorporated other books into this novel without making it feel or sound cheesy. His effortless writing almost made me believe that these books and other weird items really exist and belong in Isaac Vainio’s world. Poor Isaac! This character has been through the ringer and back and is somehow still breathing. There were times when I held my breath until I felt my chest constrict and realized I too needed to release my breath. I was irritated when I had to close the book to go to bed because drat, I had to go to the feed-me-and-my-family-day-job coherent the next day. Reading this book kept me from worrying myself to death over my husband’s deadly illness. Hidden in my bag, I carted this precious book from doctor’s appointments, numerous tests, and through surgery number one. Every chance I got, I whipped out this novel and immersed myself into its amazing world of books, magic, libriomancers, crazy people, and those teetering on the edge. It was a mad, hallucinatic ride and I loved every minute of it. Why hadn’t I ever read Hines’ work before? No worries, I don’t intend to stop now. I’m hooked. Many times while sitting in the waiting room of the doctor’s office, I cheered, exclaimed, or laughed out loud. Never once did I worry about the intrigued or evil looks I got from the other people in the room. My imagination already activated, I was too busy on the sidelines cheering Isaac over his next hurdle or getting wide-eyed satisfaction from Lena kicking or pummeling an evil enemy. There was even a love story. It started off tentative, heated up, then plummeted. Wait, what, what’d I miss?! Oh no, my Isaac. How is he going to handle all this, save the world and find Gutenberg in time? All this on one person’s shoulder? As someone who aspires to write novels and get them published, I know it’s the author’s job to create problems then give them several twists all the while pushing the protagonist to the breaking point. Well Hines surely did that and then some. The weight of the world rests squarely on Isaac’s shoulder. Sure Lena helped…but did she really? And then the twist at the end I did not see coming. What the heck? A love triangle? I tried to reach into the book to shake some sense into Isaac or Dr. Singh but it was useless, I couldn’t get to them. Wait, that’s it, that’s all I get? I shook the book, fanned the pages, darn you Jim, now I’ve no choice but to wait for the sequel. And best of all, Hines has not fallen prey to the stupid apostrophe “s” at the end of words that end with an “s” grammar debacle. Hurray! This entry was posted in Books and tagged ACTION, ADVENTURE, DRAMA, entertainment, FANTASY, geek sheek, literature, magic, SCI-FI. Bookmark the permalink.